American multinational semiconductor company AMD has today launched its flagship Radeon VII GPU, which is said to be the world’s first 7nm graphics gaming card and is touted to enhance the performance for latest AAA experiences, eSports, VR titles, 3D rendering, video applications, as well as compute workloads. AMD has said that its new flagship GPU gives up to 29% better gaming performance than its predecessor Radeon Vega 64 GPU, if the game is played in 4K, ultrawide 1440p, or 1080p with HDR. We should mention that the Radeon VII was first announced at CES 2019 keynote by the company’s CEO Lisa Su. Graphic cards with AMD Radeon VII GPU are available for purchase worldwide starting today. While in the United States, the card is priced at $699, in India it is available for Rs 54,990 with The Division 2, Resident Evil 2 and Devil May Cry 5 games. The AMD Radeon VII GPU comes with 3,840 execution units which are called as stream processors by the company. The AMD Radeon VII GPU is clocked at 1400MHz, its maximum boost speed is 1750MHz and has a 13.8 Teraflops performance bandwidth. The company has said that the GPU is manufactured on AMD’s 7nm process and has a revamped version fo the Vega architecture that was also used in Radeon Vega 56 and Radeon Vega 64 GPUs last year. 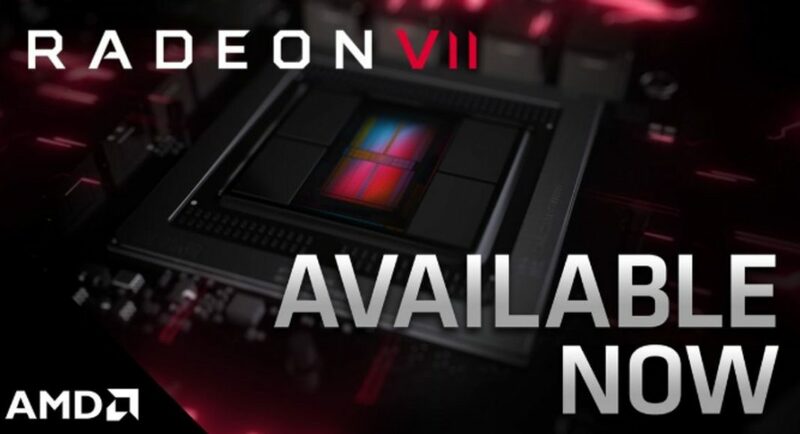 The AMD Radeon VII GPU comes with 16GB of high-bandwidth 3D-stacked HBM2 memory that is connected with a 4,096-bit bus and has a total memory bandwidth of 1TBps. It is worth noticing that this is double the memory and 2.1X the memory bandwidth that we saw on the Radeon Vega 64. The power consumption of the Radeon VII is said to be 300W and the GPU supports all of AMD’s software features like FreeSync 2, Radeon Chill, video stream capturing with Radeon ReLive, and performance tweaking with Radeon WattMan. AMD’s Radeon VII GPU directly competes with Nvidia’s GeForce RTX 2080, however, the company has not made any claims about its GPU being better than the GeForce RTX 2080 Ti. Nvidia CEO Jen-Hsun Huang, on the other hand, has called the new GPU by AMD as “underwhelming” and “lousy” at a session with journalists at CES 2019.